When it comes to finding the very best home gym equipment, some people think it’s as simple as writing down the name of favorite machines they’ve used in a health club and then trying to buy that model. You can find smoother, more effective models for the home gym than what a commercial gym has to offer. Would you prefer a commercial grade dump truck for your personal use, or a high quality pickup truck to drive around? It’s an easy answer. Similar logic applies to finding exercise equipment for your home gym. Think about it, commercial gym equipment has to be manufactured to hold up to constant use, hour after hour, day after day. For the best home gym equipment with commercial durability, At Home Fitness carries three brands that really stand out for the best combination of comfort and durability: Cybex Fitness, LifeFitness and 3G Cardio. Cybex has actually joined the Life Fitness family of brands. Life Fitness is a division of Brunswick Corporation and employs 3,000 workers worldwide. If you are looking for best place to buy Cybex Arc Trainers and Life Fitness machines in Arizona for your home gym, shop At Home Fitness. Cybex and LifeFitness make high-end specialty fitness equipment for commercial and home use, which are extremely popular at gyms throughout the U.S. and beyond. These lines also offer equipment that’s great for home use. You can bring the health club home with Cybex and Life Fitness machines that can meet a variety of workout goals and budget levels. Cybex International produces award-winning commercial fitness equipment, which is popular with everyone from first-time users to professional athletes. Go to any health club that has Cybex Arc Trainer machines and they’re almost sure to be among the most used pieces of fitness equipment in the building. Cybex Arc Trainers are incredibly smooth, durable, effective and, just as important, fun to use. For the first time in more than a decade, you can “try before you buy” when shopping for a Cybex Arc Trainer in Arizona. Whether you’re in Gilbert or Ahwatukee, Scottsdale or Desert Ridge, Cave Creek or right in Phoenix, At Home Fitness is where to buy Cybex Arc Trainer machines in Arizona. There’s an At Home Fitness location just a short drive from where you’re at in many places in Arizona, or if you live farther away it’s still worth it to get a chance to try out the No. 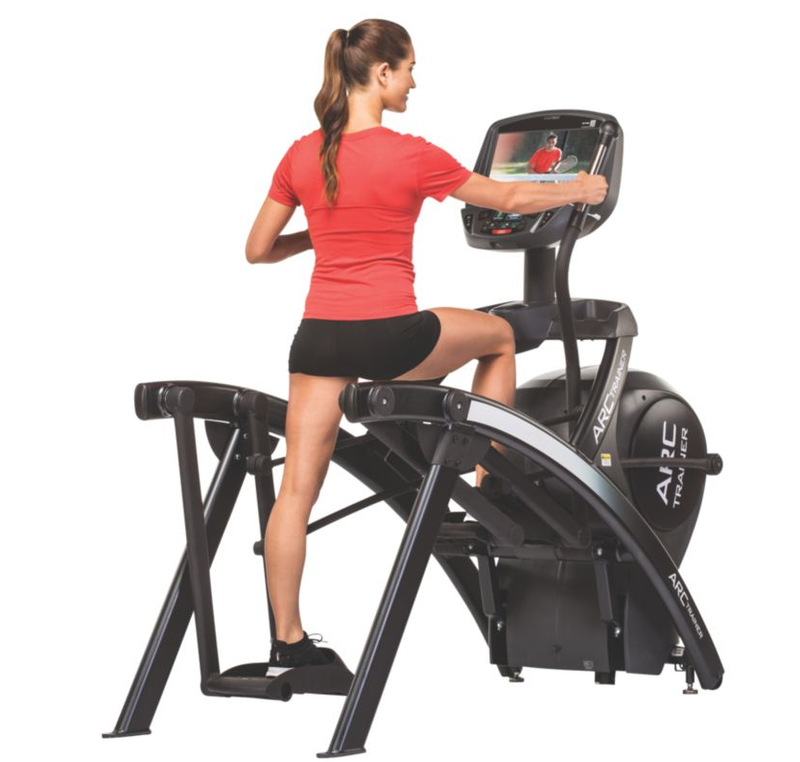 1-rated Arc Trainer machine. At Home Fitness has the Cybex 525AT Total Body Arc Trainer, Cybex 625AT Lower Body Arc Trainer and Cybex 770AT Total Body Arc Trainer available at its three super stores in Arizona, as well as online at www.athomefitness.com. Cybex Arc Trainers have been proven to burn significantly more calories (16 percent) than an elliptical machine and they put 84 percent less stress on the knees. Research has shown that elliptical knee stress is comparable to performing lunges, while exercising on an Arc Trainer is like walking. The Life Fitness roots trace back to the earliest days of the modern fitness craze with the Lifecycle in the 1970s. Today, the Rosemont, Illinois, based company is still a leader that produces equipment with both the Health Club owner and home exerciser in mind. If you are shopping for LifeFitness equipment in Arizona, At Home Fitness carries a wide variety of their products ranging from Elliptical Cross Trainers, to Lifecycles and Recumbent Bikes, to Home Gyms. 3G Cardio has a health club quality treadmill at a home gym price in the 3G Cardio Elite Runner Treadmill (MSRP $3,999, AHF sale price $3,399). The 3G Cardio Pro Runner Treadmill (MSRP $2,499, AHF sale price $1,999) might be the best fold-up treadmill on the market. For Commercial Sales call 888-351-6951, and the Service Department can be reached at 480-940-1022 or email Support@AtHomeFitness.com.